I seem to say that a lot. A plan for housework. A plan for classes. A plan for our finances. You get the picture. So what does organization look like when your children are in middle school or high school? It’s more than just a tidy toy box. Sometimes it feels like organized chaos. 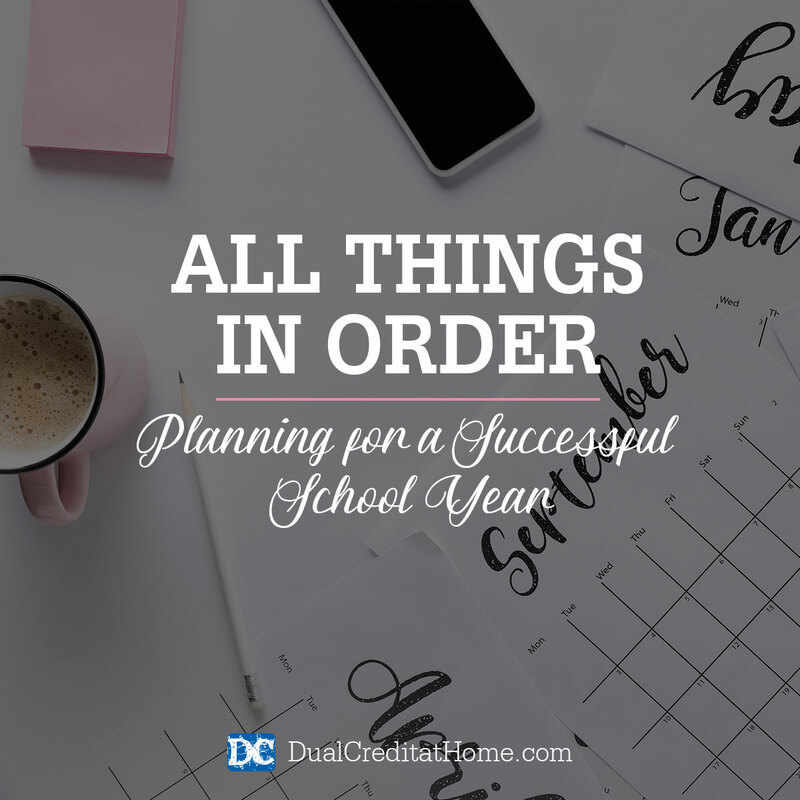 With the new school year fast approaching, here are some tips to get all things in order and plan for a successful year. Write it down. The first weeks of school are a plethora of busyness and new information. One way to stay on track is to make a schedule on paper or perhaps a schedule or calendar app. With older children, having them take responsibility for this is perfectly acceptable! So often we task details to memory only to find that something crucial has been inadvertently forgotten and will now take precious time to complete. For online scheduling and task management, consider Trello or Asana. Both are easy to implement and are free to individual users. If your student works better with pen and paper, consider a printed organizer. Well Planned Gal has a number of fantastic options for both mom and students. The Ultimate Homeschool Planner from Apologia is also an excellent choice. Clean it out. When my youngest started high school, I decided it was time to cull down the bookcase. Afterall, why would he need his 5 In A Row readers as a freshman in high school? The process of culling and decluttering results in pure joy for most. If you know you have areas that need to be decluttered, but are unsure of where to start, try the Six Week Decluttering Challenge to get you moving along. If it’s book space you need, box up the books you don’t think you want to keep and put them in the attic, garage or basement for the semester. If you don’t miss them, make a donation to the public library or take them to your next homeschool gathering for others to have. Not only do book shelves and cabinets need a good purge, but as the seasons change it’s also a great time to donate outgrown clothes in good condition to your local homeless shelter. Try something new. Everyone loves a good adventure, right? How about adding a field trip to the calendar once a month this year? Just because your students are in high school doesn’t mean they wouldn’t benefit from a hands on learning experience. In order to organize additional activities into your school schedule, you must plan well by marking the dates ahead of time on your school calendar. The actual activity can be filled in as the details are determined, but having the date set aside will give them something to look forward to and you can clear the day from other school assignments. For example, if your student shows an interest in cooking arrange for him or her to shadow a local restaurant professional. If law enforcement is in the future, ask about a tour of the local forensics lab. Interested in art? Visit with the curator of your local museum. Finally, remember to add a little grace in your efforts. A clean house, categorized bookcase, tidy schoolroom, and perfectly balanced calendar are wonderful goals. We should all strive to find peace in order but remember that not every day will run smoothly, some deadlines will be just shy of the mark and an occasional book will be misplaced. There is renewed energy in careful preparation. There are blessings hidden in your efforts to keep a current calendar of events, create new space by donating unused items, or expanding your experiences in fresh, new places. Let the adventures begin! Kay Orr is a Jesus follower, wife of over 25 years to Chris, a MomStrong mom to five, and Founder and CEO of Love of Logistics. She believes we are all warriors in a battle to guard our children in a world that demands their every attention.